My kids are all officially back in school. They are growing up way too fast, but I love watching them take on new adventures and experiences. What a joy they are in my life! 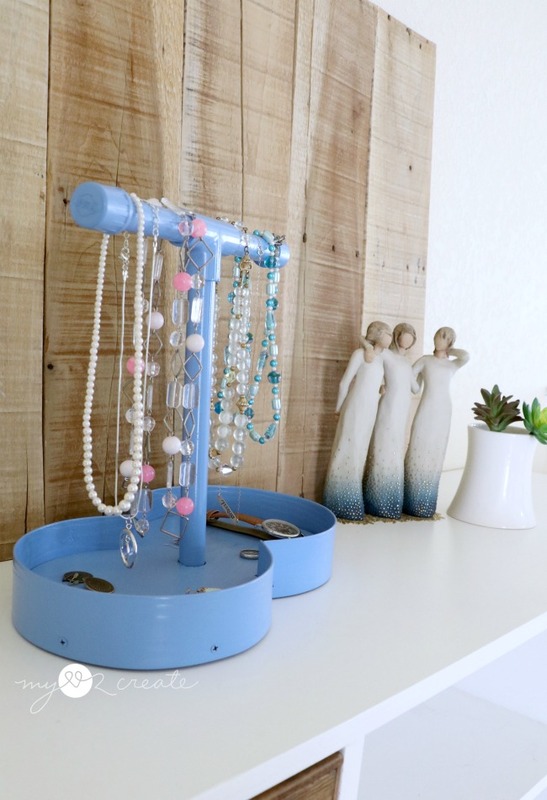 Today I have a very cool project, I am going to show you How to make a Jewelry Holder! Hooray! As part of the Power Tool Challenge Team this month we created projects using unconventional materials. 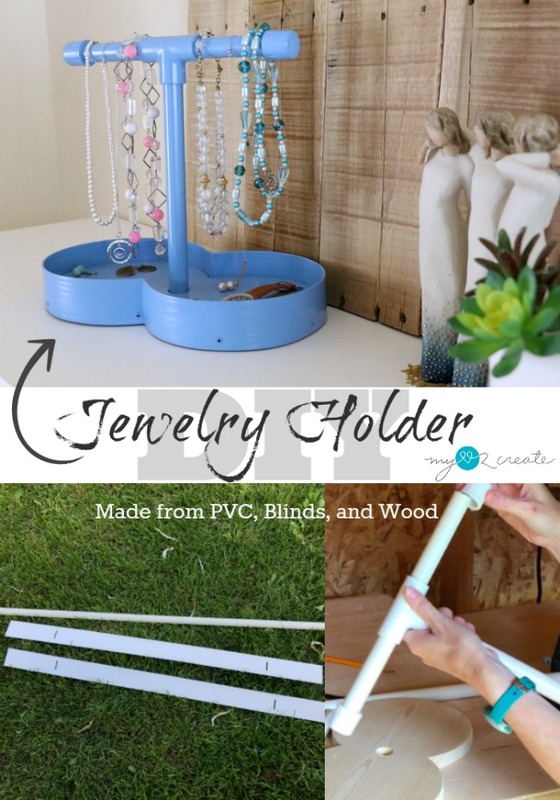 I choose to use PVC pipe and some old blinds, plus some scrap wood to create my Jewelry holder. I had several ideas of things I could make with PVC pipe, but as I was pondering and looking at my stuff, I spied my old blinds, and I thought of a different idea. Remembering my Rustic Industrial Letters I set to work. This post contains affiliate links that help me at no charge to you! Read more, and thank you! 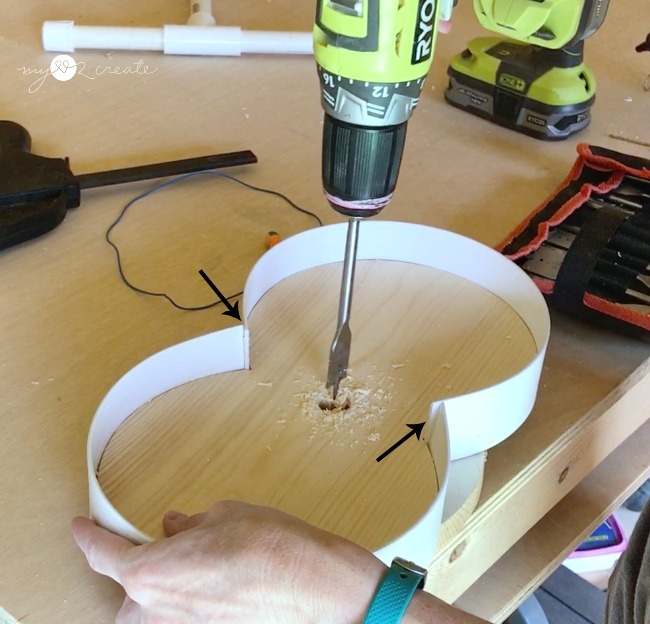 I wanted to do something fun for the base of the jewelry holder and circles seemed perfect. 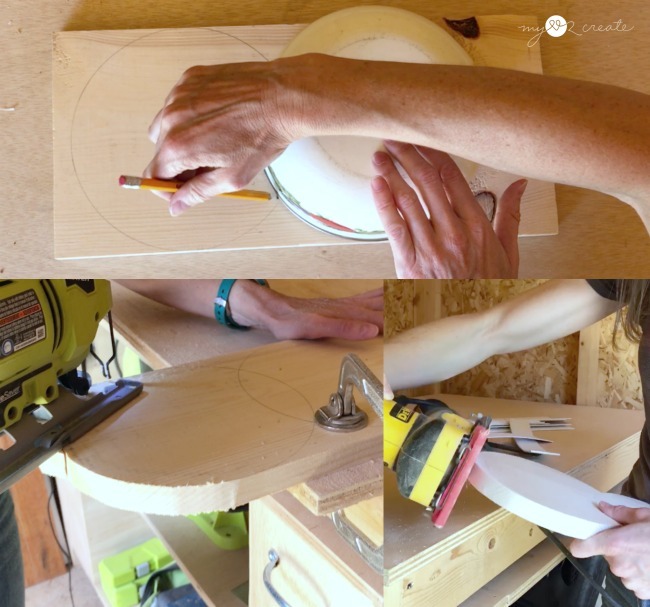 Using a bowl from my kitchen and a piece of scrap 1x8 wood I traced on two circles with the middle of the circles overlapping. 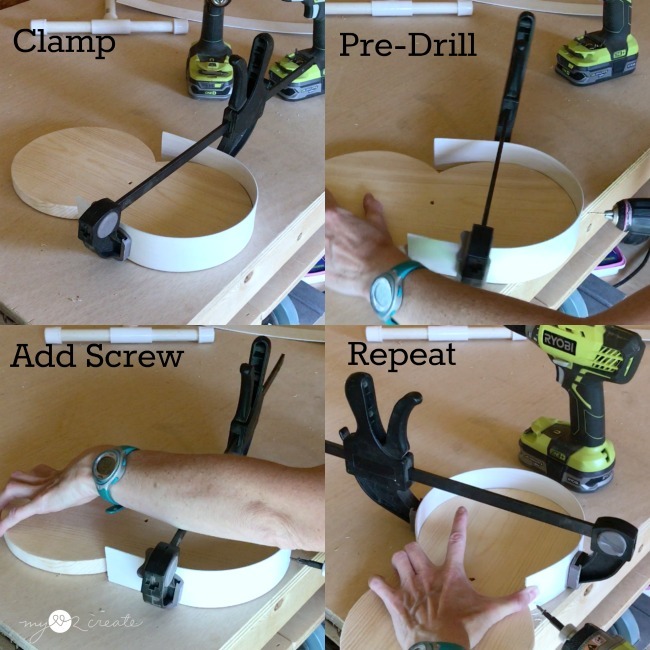 Then I cut out the figure 8 shape with my Ryobi jig saw and sanded the edges and top smooth with my DEWALT Sander . In the center of the figure 8 pattern I marked center using my Combination Square . 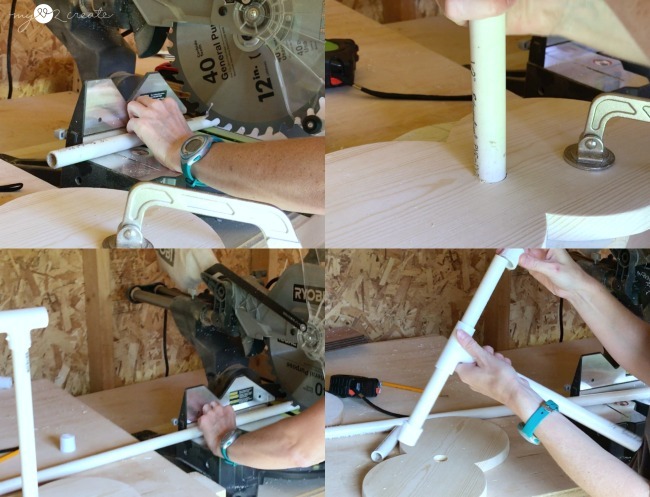 I used a 3/4 spade drill bit to drill a hole for my 1/2'' PVC pipe. Because my pipe was a tiny bit wider than the hole I wiggled the bit from side to side in a circle as I drilled to widen it a tiny bit. 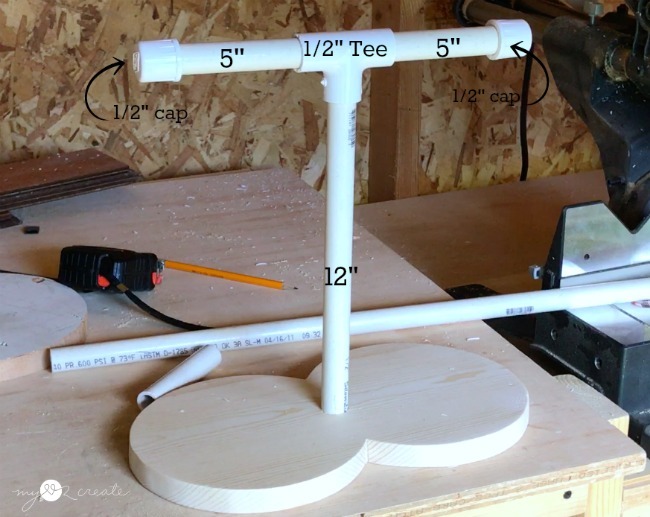 For some reason I had some scrap 1/2'' PVC pipe pieces laying around, so I used them instead of buying some. I did have to purchase two 1/2'' caps and a 1/2'' Tee (s, s, s). I got them for less than $1.50, which was the grand total for this project! Woo hoo! You can see the cuts I made in my 1/2'' pvc pipe above. 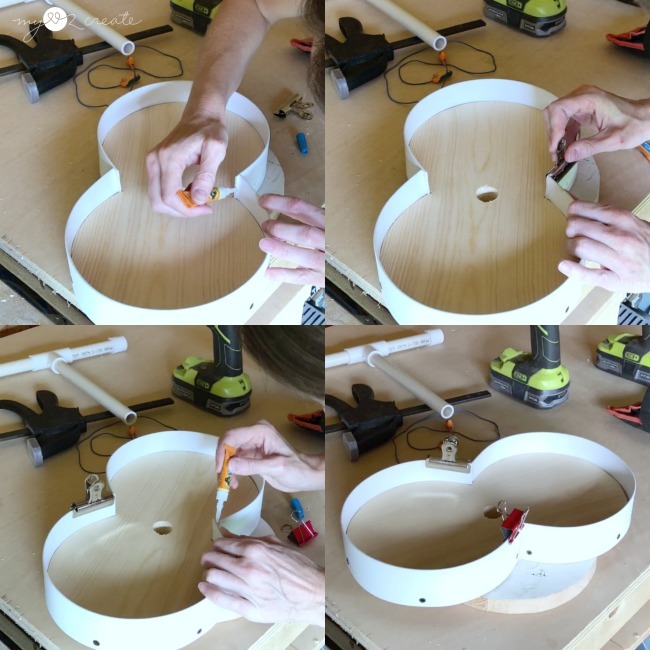 I just had to cut the two 5'' top pieces and the 12'' bottom piece, then I fit all the piece together and did a dry fit in my base. Of course you can customize it to any size you want! Now for the fun part...the Blinds! I have done several projects repurposing blinds, besides my Rustic Industrial Letters, I have done my Reclaiming Blinds to use on Teacher Gifts, my Ombre Sign made from Blinds, and my Sunburst Mirror made from Blinds. 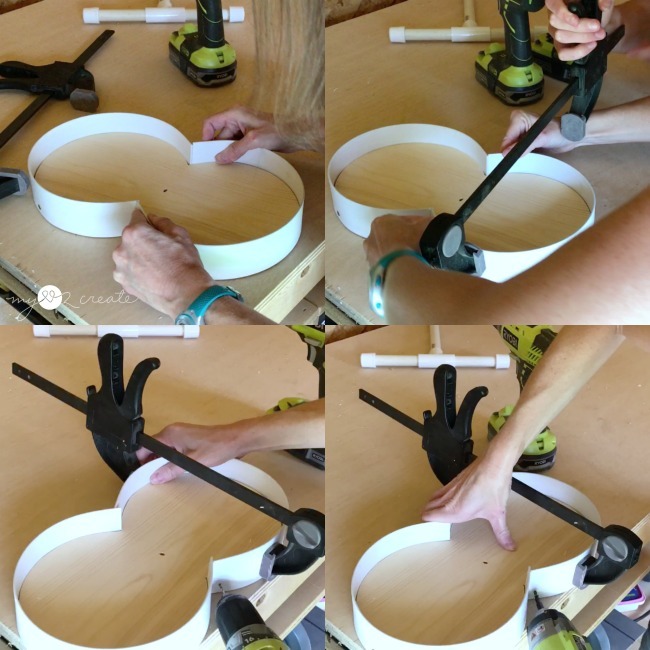 I cut one of the blinds on my miter saw to fit around a circle in my base, then tested it to see if it fit. Blinds will bend to an extent, but they don't hold their shape. So I had to clamp it in place in order to secure it for screwing it to the wood base. I did try hot glue, and nope...didn't work. So clamping seems the best policy for this. :) Once it was clamped I pre-drilled my holes and then attached the blind to the wood with the screw. I repeated the same process to secure it in 4 more places. For the second circle, I cut my blind and did another dry fit to make sure it fit. Then I had my son help me clamp it in place. I repeated the process of how I attached the other side. 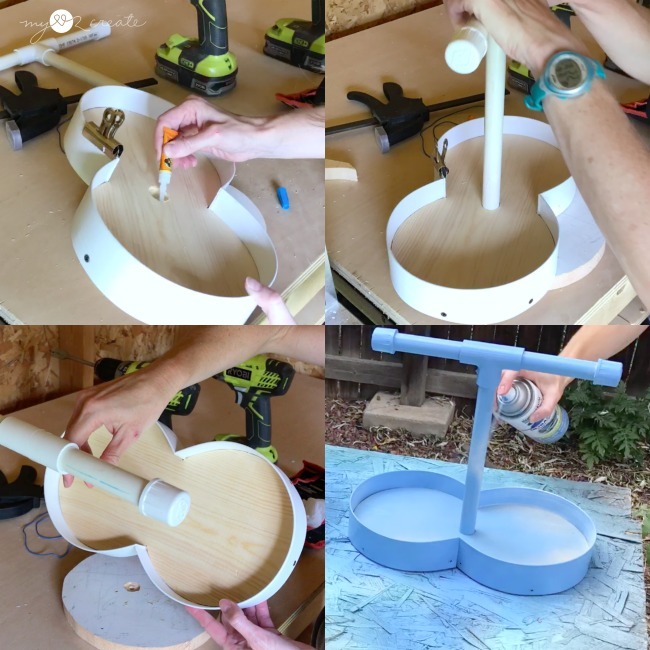 It was at this point that I realized I had made a mistake...remember that nice circle I had drilled for my pvc pipe? Do you see it? Ummm, no. You don't. I accidentally attached the blinds upside down! Figures. Lucky for me it was easier to just drill the hole all the way through, instead of removing the blinds and replacing them. It was a simple fix, thank goodness! Now I had to address the ends of the blinds, see how they don't match up? I tried hot glue again...hey, it was right there so it was worth a shot. Although I knew it wasn't going to work. I grabbed the Gorilla Super Glue . But I needed some way for the blinds to be held into place while it dried, without getting super glue all over my hands. I ended up using Metal Binder Clips . I simply added the super glue then used the clip as a stopper to make the blind stay in the exact spot I needed it, right up against the other blind. After the glue dried I removed the clips. It worked perfectly! I really love how it turned out! Best part? I made this in about an hour, and for less than $2...not bad! I love projects like this! 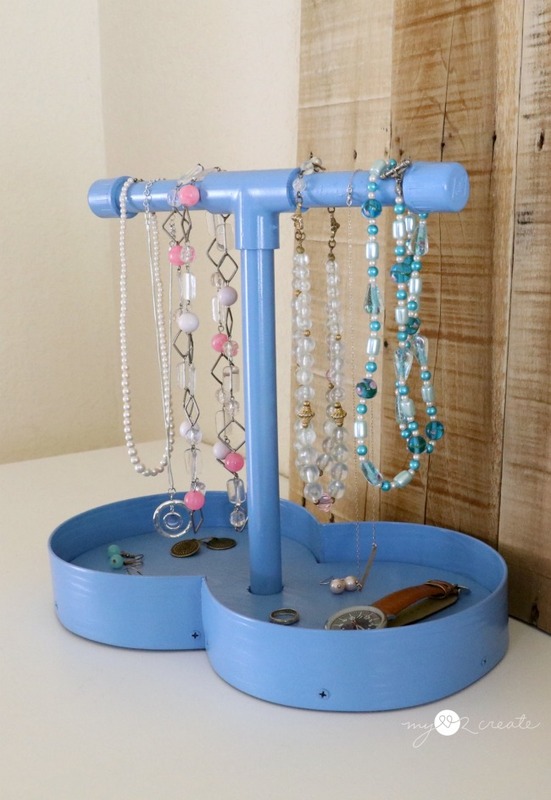 It is a perfect little jewelry holder, with a place to hang necklaces and bracelets. Not to mention the fun figure 8 shaped tray...just to keep things different! The blinds make a very nice edge.. So you don't loose your earrings, rings and other accessories! 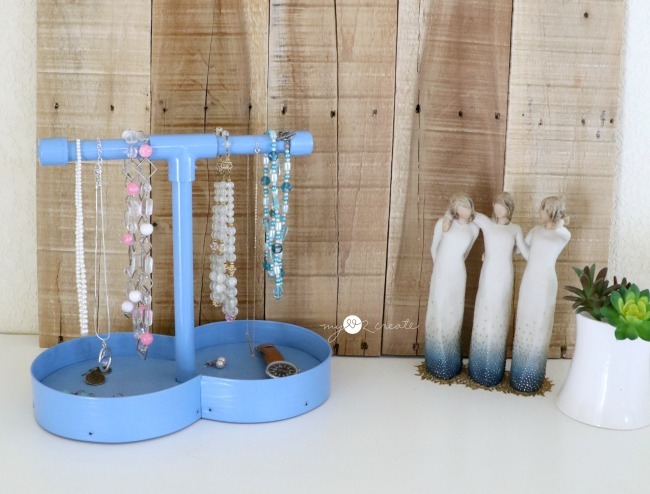 I love my Rustic Pallet Jewelry Holder, but I am digging this one too! I may have to give one to my daughter because I certainly don't need two! Which one? Which one? What do you think? 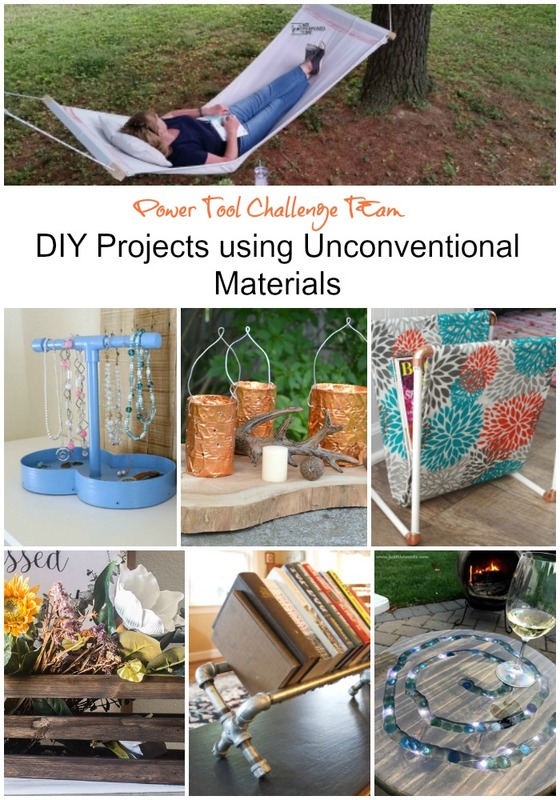 Would you like to do a project using Unconventional materials!? I love mixing things up, and really love a challenge, maybe you do too? 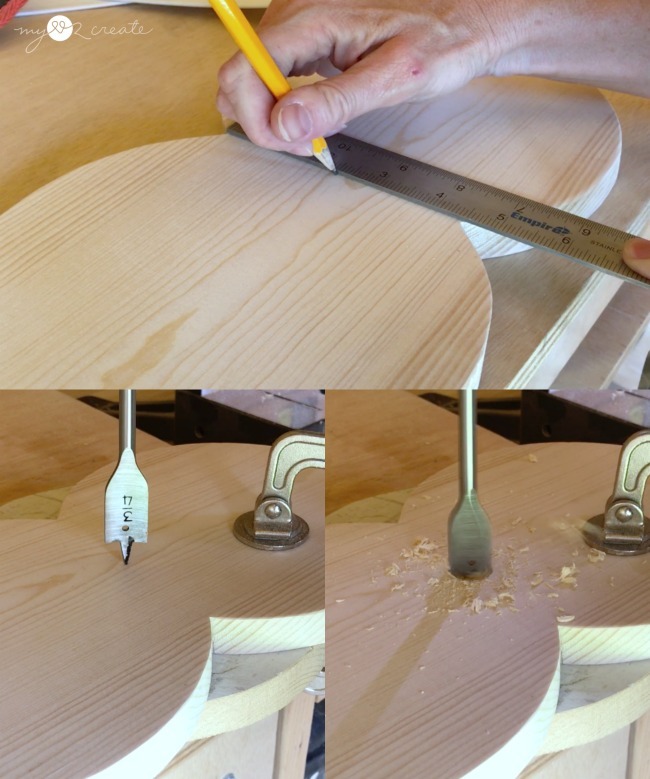 Check out all the other projects this month from the Power Tool Challenge Team! They are all so cool, and get building and creating! You are so clever to come up with these great uses for items that normally get thrown away! 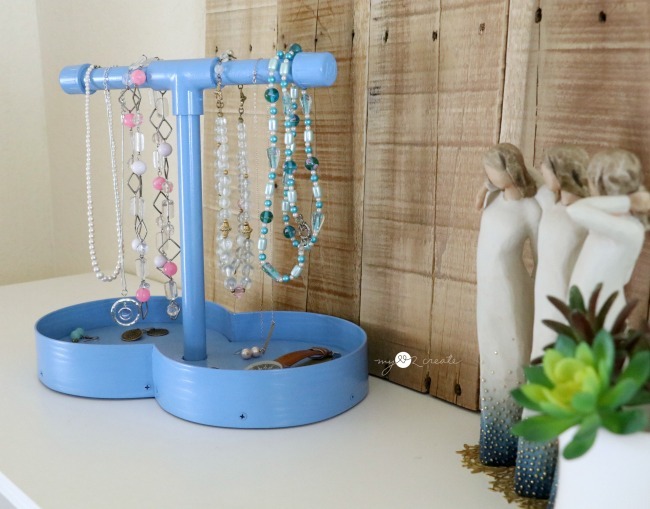 I love this jewelry holder and the idea of using blind slats is brilliant! I could see me doing what you did with gluing the blind pieces on the upside down. I would be so focused on getting them right... we're like peas and carrots Mindi! Blue? I can't believe you painted something blue.... so unlike you! I'm happy to be in the power tool challenge with such creative ladies! 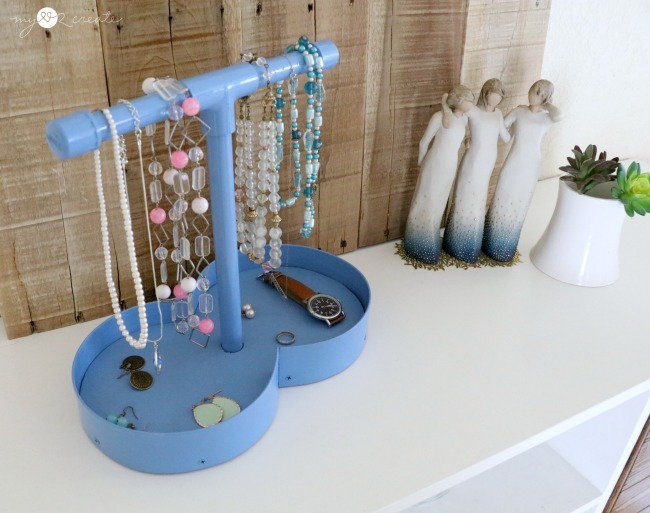 You are so incredibly creative to think to use old blinds for the sides of your jewelry holder base. You created something cute and very useful. Great project! Wow...as always! I was totally wondering what you used for the sides. I have several old blinds I'm getting ready to toss...I suppose I'm going to hang onto a few now! 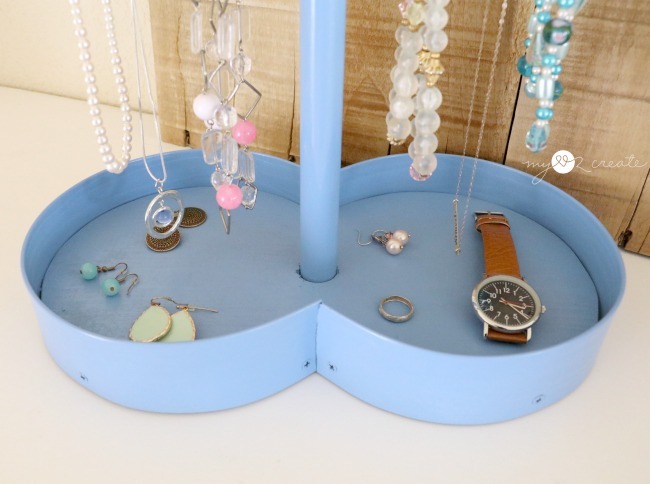 Your jewelry holder is super! Love how it all came together. WHAT??? What a great use for blinds! Love how it turned out. That's beautiful and I seriously love that color blue. I am going to have to copy that!